When we arrived in front of Nonbe Daigaku on a rainy Saturday evening (Hello Brussels! ), I was a bit hesitant whether this was really the place that looked so nice on the pictures I had previously seen. There was a big phone number made from red tape, glued to the window, a not too inviting entrance door and a quite worn-down facade. But, as we all know, it’s the inner values that count. We walked in and the very nice waitress showed us our seats right at the counter, exactly where I wanted to sit. 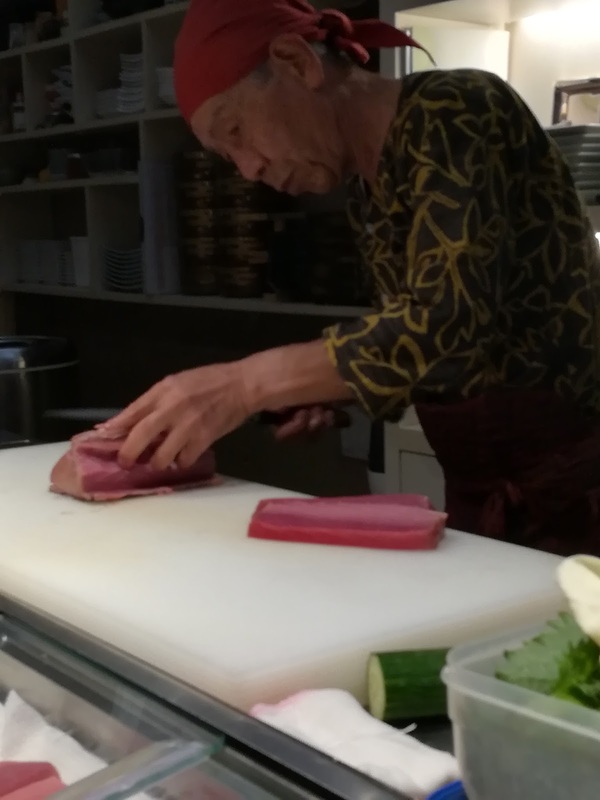 And this is where the experience starts; you can watch the sushi Master Suetsugu Yosuke cutting, slicing, arranging fish in all kind of varieties on platters, in bowls, on rice as tartare. It’s fascinating, how he takes up a piece of fresh fish and slices it with utter patience into perfect thin pieces. We ordered a beer and a jug of warm sake for two. 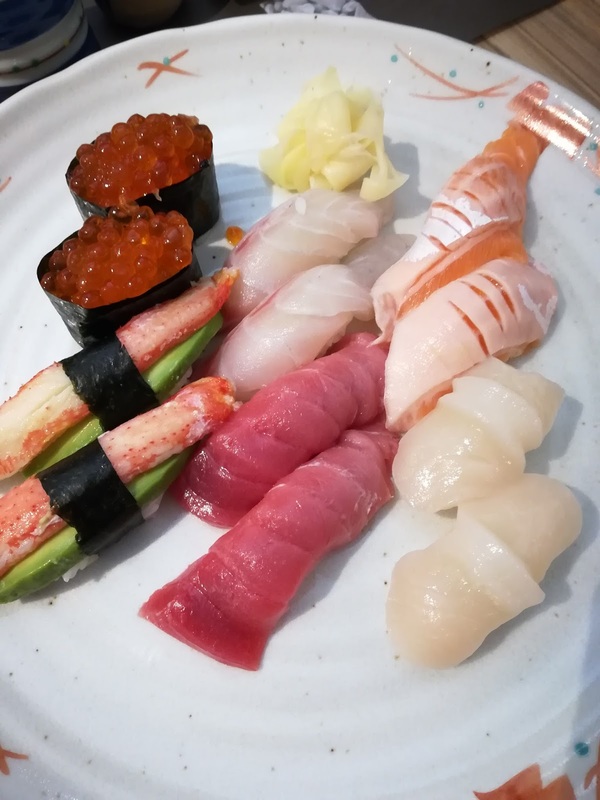 After I underwent one and a half-life crises what to choose, we decided to try the medium sized Sashimi platter, the Nigiri sushi platter and soft shell crab Tempura. The waitress disappeared into the back room and came back with the sake and a little box with around 10 little porcelain mugs, just about the size of an egg cup. Each one being different, both of us had to choose the one we wanted to drink from – a Japanese tradition. Happy about my choice, I lifted up the jug and was about to start pouring sake into the little cup, but when I was almost about to fill it, Johan took the jug from me and explained to me another tradition: You never pour the sake into your own glass, but your table neighbor has to do this. Of course, this ended in me giving weird eye signals to Johan during the whole evening, so I could drink more of the delicious sake. 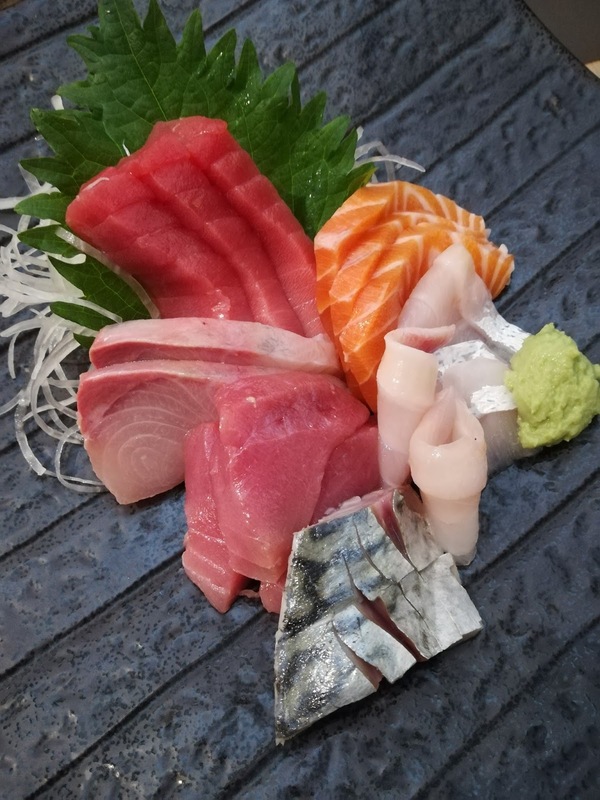 The first dish, the sashimi, arrived. 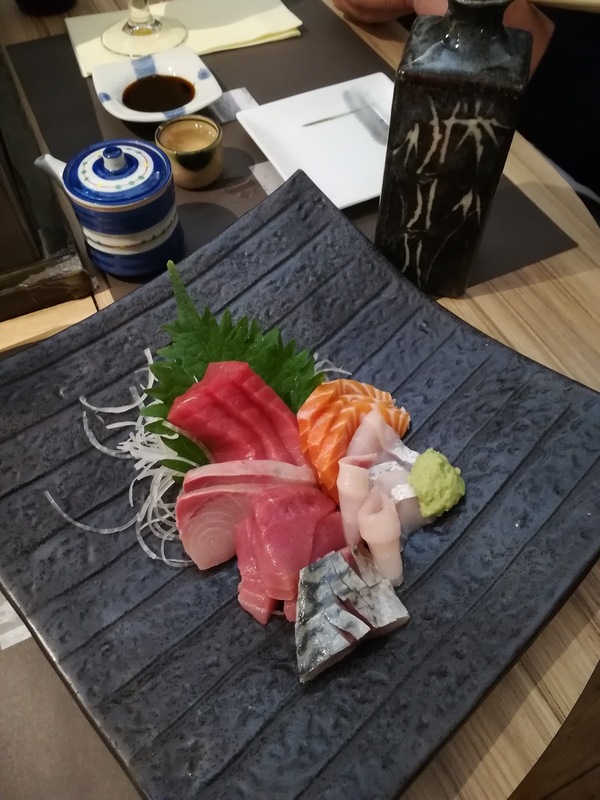 Six different kinds of raw fish were arranged neatly on a grey plate along with some wasabi, ginger and Japanese radish. Salmon, tuna, fatty-tuna, herring and white fish. I will not describe in detail how the fish slowly melts in your mouth and how I was absolutely amazed by the delicate texture and a unique taste – because you might get very, very jealous. This was by far the best sushi I have ever eaten, and even Johan, who went to Japan a few years ago, agreed with me on this. The nigari sushi was equally great, fresh, and soft as butter and the rice on which the fish was placed tasted amazing, too, having the perfect texture. The tempura arrived last and maybe it was because after this fish, hardly anything could’ve been better, but I wasn’t swept off my feet by it. It was crispy, the crab was very good, but nothing mind-blowing I’d say. The decoration of the place is very simple, close to inexistent. 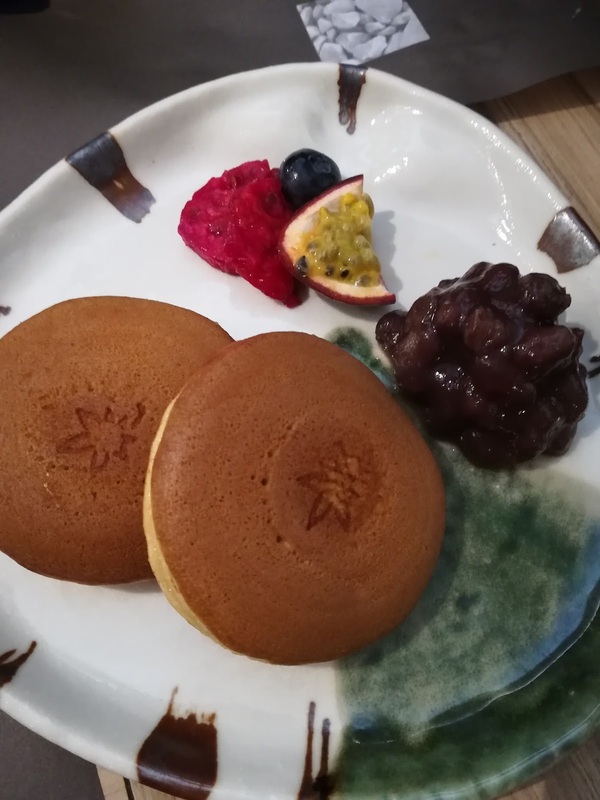 It’s kept in brown tones, some little and one very kitschy (have a look at the sushi-clock) details, but that’s why you should reserve and sit at the bar, because that’s where your focus should lie. The food here is absolutely amazing and everyone who is a fan of raw fish of perfect quality should come here. Prices are not low, but fresh fish has its price and both this and the long way are more than worth it, as the place is quite far off (at least for Saint-Gilles residents like me). It’s really a place for a special occasion, or several special occasions and an address you shouldn’t miss! Good to know: Make a reservation!